In 1972, Jean-Louis Fougeray created Domaine Jean-Louis Fougeray. Over the years, the domaine grew to 25 acres with vineyards stretching from Marsannay to Savigny-les-Beaune. 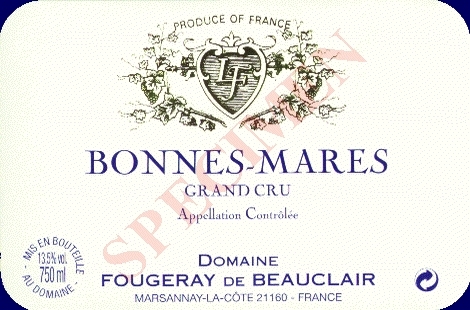 In 1986, Jean-Louis partnered with Bernard Clair to form Domaine Fougeray de Beauclair. This estate now owns 54 acres of vines, and bottles the only Bonnes Mares originating from the Morey-St.-Denis side of this Grand Cru vineyard. Current annual production is 10,000 cases. Patrice Oliver has been the winemaker since 1999. This is a superstar domaine that manages to keep its prices within reason. Domaine Fougeray de Beauclair is a true family operation. Patrice Olivier makes the wine with his father in law. Laurent, Patrice's wife runs the marketing. They have poured their outstanding Bonnes Mares Grand Cru at several International Pinot Noir Conferences. Considering the quality, the Bonnes Marres is very reasonably priced.